If you have ever eaten or cooked Thai food then there is a good chance that you will have tasted lemongrass. However, this ingredient, which is popular in Asian recipes, has many health benefits and can be used to help treat and relieve a number of health problems naturally. But did you know that lemongrass essential oil has a lot of uses and health benefits as well? 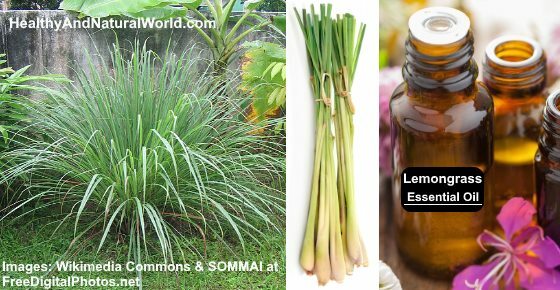 What is Lemongrass Essential Oil and How is it Produced? Lemongrass is a plant which belongs to the grass family and has a very distinct citrus smell to it. There are over 50 types of lemongrass (Cymbopogon) that grow in the warm, subtropical regions of the world, but it is the Cymbopogon citratus variety which is generally used in cooking and has most of the health benefits in it. Lemongrass essential oil is extracted from the leaves by steam distillation and has a light consistency which is pale to bright yellow in color. Lemongrass has been a part of Traditional Chinese Medicine (TCM) and Ayurvedic medicine for centuries. Some of the traditional uses of lemongrass essential oil were as a remedy for fevers, treating muscle spasms, reducing anxiety, increasing energy levels, treating menstrual cramps and infections. Research into the properties of lemongrass essential oil shows that it contains many substances which have antibacterial, antifungal, anti-inflammatory and antioxidant properties. Therefore, lemongrass oil can have an important role in helping to relieve many ailments that affect us today. How can you use lemongrass essential oil to help improve your general health and feeling of well-being? Here are some of the best benefits of lemongrass essential oil. Antioxidants are important in maintaining healthy skin because they help to neutralize free radicals and therefore increase the production of collagen. Antioxidants also help to kill off free radicals in the body and they are essential to fighting off disease and stop cells becoming cancerous. Other studies have shown that lemongrass contains some of the most powerful antibacterial properties of many essential oils, 3 and sprays containing lemongrass essential oil can even be used to disinfect the air.4 It is also effective against C. diff and E. coli bacterium. Inflammation is the body’s response to autoimmune diseases, infections, allergies and cancer. Lemongrass has analgesic properties that can help reduce pain and inflammation. One study published in 2010 showed that lemongrass oil was able to relieve inflammation in a similar way that COX-2 drugs work.7 COX-2 drugs are non-steroidal anti-inflammatory drugs (NSAIDs) which are prescribed to reduce inflammation in rheumatoid arthritis suffers. To make a topical ointment for the relief of joint pain, you can mix a few drops of lemongrass oil with coconut oil and massage this into the affected areas. Coconut oil also helps to reduce inflammation. You can find more herbs and advice on how to relieve joint pain in my article about the best spices & herbs to relieve joint pain and how to use them. You can use other natural ingredients to lower your cholesterol such as apple cider vinegar, and this natural substance. Because of its antibacterial activities, lemongrass essential oil can also be used as an effective mouthwash to reduce plaque and bad breath. To make a plaque-reducing mouthwash, all you have to do is put 1 or 2 drops of lemongrass essential oil in a cup of water, mix it well, and use as you would a regular mouthwash. You can find more ways to improve your oral health in my articles on how to remove plaque naturally and 7 ways to treat bad breath naturally. Lemongrass essential oil can also help to relieve muscle and joint pain when a few drops are added to any carrier oil (such as jojoba oil) and then massaged into the affected area. You can also add other essential oils which have proven to have anti-inflammatory properties such as vetiver, helichrysum, lavender, or other essential oils that relieve pain and inflammation. You also have the added benefit that the aroma of lemongrass can help to relax the mind. To get all the calming benefits of lemongrass essential oil you can diffuse it at your home, add some to your body lotion or you can put few drops in your bath mixed with a carrier oil. For a good night’s sleep, you can put 2 or 3 drops on a handkerchief next to your pillow. It can not only help you sleep better, but also help you sleep longer. You can find more calming essential oils in my articles about the best essential oils for a better sleep and the best essential oils for anxiety. Lemongrass has been traditionally used in ancient medicine systems to help restore and balance the digestive system. Asian cultures often use lemongrass to bring down fevers. In fact, it is often referred to as “fever grass.” It can be ingested in a small quantity as a hot or cold tea. Some people also use it in a foot-bath to bring down a high temperature. There are many practical ways to use lemongrass essential oil for its health benefits. You can add a few drops to a face mask to help cleanse and tone the skin. Or you can add some lemongrass essential oil to a body scrub to help in getting rid of toxins from the skin and improve the skin appearance. See more information in my article about the best essential oils for skincare. If you have a cold or flu, then by adding some lemongrass essential oil to a steam inhaler you can help unblock your sinuses. You also get a pleasant side effect because it will also help improve your mood and reduce your anxiety – something we all need when we’re feeling sick. You can also combine it with other essential oils for cold and sore throat, or essential oils for sinus infection. The antibacterial, antifungal and antimicrobial properties of lemongrass essential oil make it a great topical treatment for acne and skin blemishes. Just add one drop of lemongrass essential oil to some coconut oil and gently apply to the spot or pimple, or mix a few drops of lemongrass essential oil and other essential oils for acne with a carrier oil and apply to the affected area. If you suffer from pimples, combine lemongrass oil with these natural treatments for pimples. Lemongrass can also help keep bugs away and is one of the most effective mosquito and fly repellents. You can easily make your own lemongrass insect repellent spray – it literally takes just a few seconds to mix it and it’s a great alternative to the conventional insect repellents that are full with harmful chemicals. 30-50 drops of one or more of the following essential oils: lemongrass, citronella, peppermint, eucalyptus, basil, rosemary, tea tree, geranium, lavender and thyme. The more drops you use, the stronger the spray will be. Pour the witch hazel in a mixing jar and add the essential oils. Shake well and place in your spray bottle using a funnel. Shake it before use. Make sure you don’t get any in your eyes, and when using for your kids just place a little bit over a small area to make sure they are not allergic to any of the essential oils. You can also get the benefits from lemongrass essential oil by adding a drop or two to recipes, and remember that lemongrass is a main ingredient in many Asian dishes and it goes very well with coconut milk. When you ingest lemongrass oil, make sure it is labelled as food grade. The antifungal activity of lemongrass essential oil means that it can fight fungal infections like athlete’s foot. You can add a couple of drops to some coconut oil or carrier oil and apply to the affected areas before bedtime. Lemongrass essential oil is also great in your own DIY cleaning products. For example, a few drops of lemongrass essential oil in a vapor spray can help to kill of odors in a room, disinfect surfaces, and kill bacteria in the air, or you can use it to make your own natural household cleaner. Lemongrass oil can help relieve menstrual cramps. Women can either mix a few drops of lemongrass oil and carrier oil and add into bath water or use it as massage oil. Lemongrass oil is generally safe when using for short-term medical use or when used in small quantity in foods. However, taking large amounts for long periods of time could cause upset stomachs and headaches. As with all essential oils, lemongrass oil should never be directly applied to the skin, but should always be added to a carrier oil. If you are pregnant or breastfeeding, you should avoid taking lemongrass oil. If you are interested to learn more about essential oils you can find useful information in my e-book Magical Aromatherapy. This e-book will help you to discover the power of essential oils and the most effective ways to use them. 1. Evaluation of 11 essential oils as antioxidants in foods. 2. The activity of lemongrass essential oil against Staphylococcus aureus. 3. Inhibition of MRSA by essential oils. 4. Vapor-phase activities of EO against antibiotic resistant bacteria. 5. Lemongrass EO as an anti-inflammatory drug. 6. Cymbopogon citratus leaves as atopical anti-inflammatory agents. 7. Lemongrass oil suppresses COX-2 expression. 8. Cholesterol reduction after intake of lemongrass essential oil. 9. Efficacy of 0.25% lemongrass oil mouthwash. 10. Neurobehavioral effect of lemongrass essential oil. 11. Gastroprotective effect of cymbopogon citratus EO. HSS agency charged with protecting the public health and safety. Trusted, award-winning medical and health information resource. American Cancer Society is fighting cancer with research, education, patient care, and rehabilitation. The world’s most widely-used medical guides. Trusted medical directory that includes 750,000+ of America’s physicians and surgeons. The main governmental agency for protecting the health of U.S. citizens. Diseases, symptoms, injuries, and more with photographs and illustrations. Extensive and trusted resource for medical research in the United States. The most widely circulated peer-reviewed medical journal in the world. Publishes new medical research findings, review articles, and editorial opinion. Free digital archive of biomedical and life sciences journal literature. Provides open access to hundreds of peer-reviewed medical journals. At Healthy and Natural World, our mission is to empower people to take control of their own health by providing comprehensive, practical and well researched information. Our articles are based on scientific evidence, written by experts and fact checked by experts. We strive to be objective, unbiased, honest and to present both sides of the argument. Our articles contain scientific references which are numbered. Some of the references are clickable and some are found at the end of the article in the references section. The references are clickable and linked to peer-reviewed scientific papers or authority medical sites.